Pushing off hard after rounding the barrel helps your horse explode to the next barrel. A strong rear end can give your barrel horse an advantage in running against a timer. After all, a tenth of a second in barrel racing can mean the difference between bringing home a check and leaving empty-handed. Building up your barrel horse's rear end is like exercising any horse: it takes time and consistency. Trot and lope your horse in tight circles. Then move out to larger circles while staying in a consistent pattern. This makes him engage his rear end and push rather than pull as he moves, building up his rear muscles. Work in various circles for about 20 minutes at a time or until your horse is winded. Work your horse’s rear end by trotting him toward a fence and asking him to stop a few feet from the fence. As he stops, apply pressure with the outside rein and your inside leg, asking him to “roll back” on his hocks. Rollbacks help make your horse strong and supple. Perform rollbacks after your horse is warmed up, to avoid injury. Walk and trot your barrel horse up and down hills. Moving up hills engages her hind end and builds up the rear muscles. 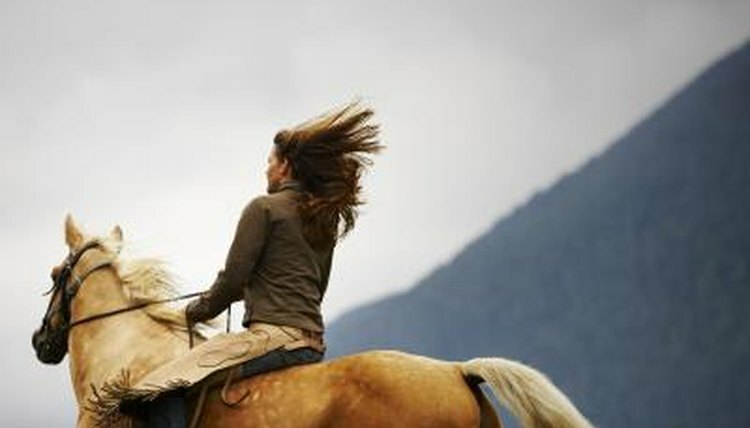 When starting, work on the hills for approximately 15 minutes until your horse builds up stamina.  Always warm up with a walk, trot and lope regimen before starting the workout. Also, ask your horse to bend and flex at the pole to loosen his neck and shoulder muscles. While it isn't required, a round pen helps keep your horse in a circle.